The Coach House has been finished to a high standard and offers modern contemporary living in this five bedroom family home, including guest suite, gardens, garaging and private parking in the sought after village of Whalley. The Coach House has been finished to a high standard with high quality fixtures and fittings throughout. The property offers great space for both entertaining and a growing family. The main living room is the central location to the house with machined oak flooring, a feature fireplace with inset log burner and two sets of double doors which open out onto a large orangery which is split between living and dining areas. The whole area being superb for entertaining. To one end of the house is a snug or children’s TV room along with an entrance hall and cloakroom. To the other end there is a modern breakfast kitchen and utility room with a back door on to the driveway, providing access to the garage. 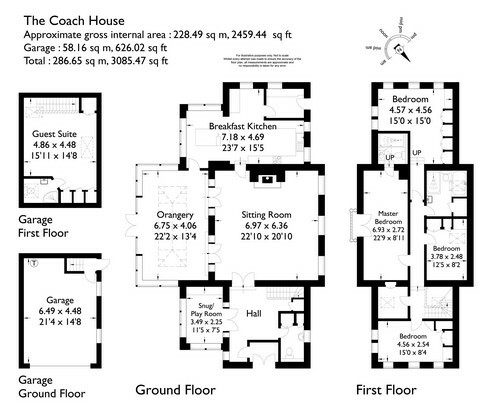 On the first floor is the master bedroom with en-suite shower room, three further bedrooms and a house bathroom. The Coach House has an electrically operated private gated driveway with ample parking. The gardens lie to the front of the property with a large lawn, raised growing boxes, a greenhouse and a mature hedge lining the boundary, providing privacy to this outdoor space. Leading out from the orangery is a large decking and patio area. To the far end of the garden is a brick and oak framed building which has a pizza oven, brick BBQ and central island/bar installed, perfect for lazy summer days and outdoor entertaining. The Coach House has a detached garage with a full guest suite above which consists of a bedroom with en-suite shower room. Mains water, electricity, private drainage, oil fired central heating. Broadband is available at the property. Strictly by prior appointment with sole selling agents MSW Hewetsons.